I’m rather in awe that I’m here again. Only 4 and a half months ago, I was in awe that I’d completed the camino Frances- albeit with manky feet. Since then, I’d been on a stint on the Camino del Norte, and was ready to start my third one with my son to Finisterre. I had wanted to do Finisterre during my camino. But I had become very disheartened towards the end of my journey. Disheartened and over pressured to finish the camino on someone else’s timetable that my feet were a blistering mess by the time I got to Santiago, I was sick as a dog and had such a bad athsma attack I thought I needed to go to Santiago hospital. It’s no coincidence that I’ve not finished my posts my Day 40 onwards. 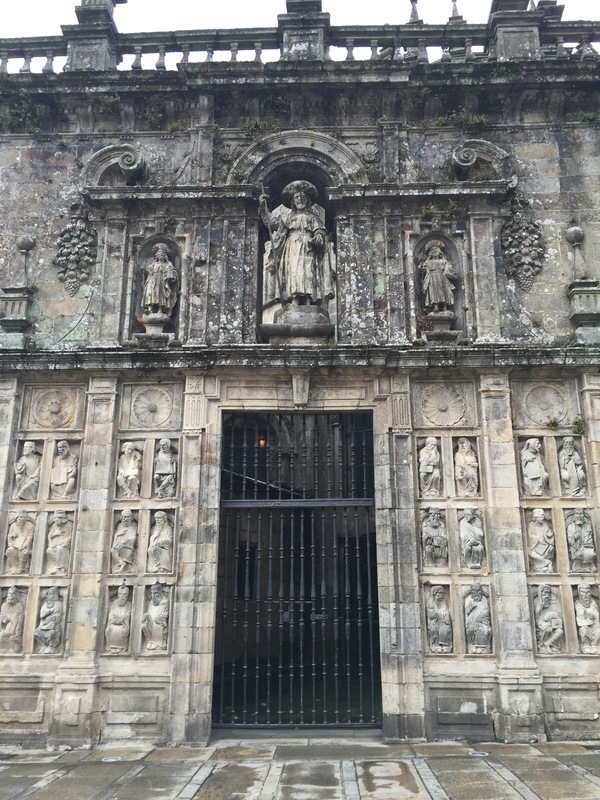 I’ve needed time to ease and erase at some things that were said, my annoyance at having my camino hijacked, my annoyance at being told to take the bus to keep up, my annoyance at myself for not having just said “Bon voyage” and gone my own way. It was then that I simply decided the camino could be done in many different combinations, any which way I chose. It didn’t have to be one way, it didn’t have to be in one go. And I knew that I wanted to come back and I wanted to walk with Son. So I felt proud as we stood in front of the cathedral that I was there. I was there – to finish what I’d started in the year. Finishing it in the same year. Familiar was the scene, like I was there only yesterday, yet so different. The light was softer, the church looked different. I was different. Our flight to Stansted Airport was uneventful. As usual, I worried a bit that I had not left enough time but of course I had. Because we did not check in luggage, we had plenty of time for breakfast. Yes, a nice bacon and eggs lunch and coffee set me back nearly £20 at the airport. London is crazy expensive, especially at airports. Ryanair is an efficient airline. They gathered the outgoing passengers ready for boarding even as the first passengers disembarked. The seats felt warm as we plonked ourselves into them. We watched as other passengers boarded. It’s getting easy to spot the pilgrims. The shell is a giveaway, but so are the hiking boots and backpack. We struck up a conversation with a few people and learned that one was hiking from Sarria and another from A Coruna. Catching the airport bus into Santiago, I eagerly looked out of the window to spot the Eucalyptus Forrest just outside Lavacolla. I was remembering my time here not 5 months previous. Time flies. As the bus wound its way around the highway, I spotted the hotel I stayed at in my last night in Santiago, the San Jacobo Hotel. 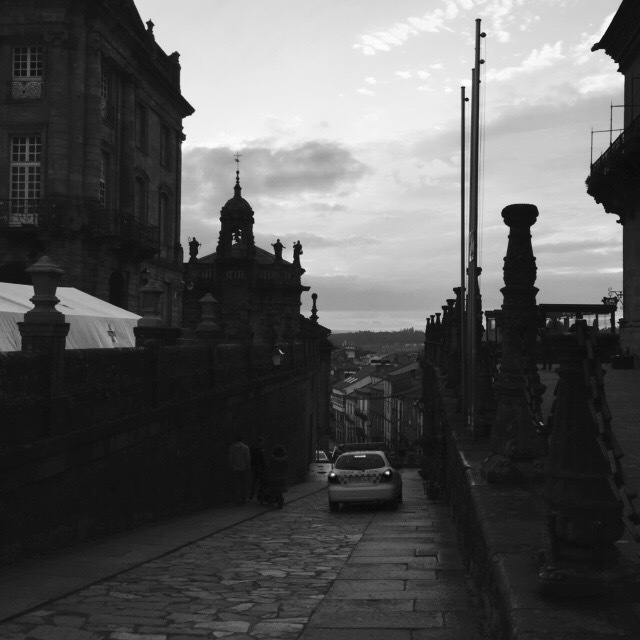 Along that road is the path all pilgrims take to Santiago. Navigating through the medieval streets, we made our way to the Galician Tourist Board for directions to Finisterre, a list of albergues and a credencial. The credencial was this ugly A4 photocopy with a faded stamp from the Galician body. Really, I thought they could make a better effort than that. Maybe they ran out of the official versions. Instead, I decided to use the official map to Finisterre as the credencial as it had a spot for receiving stamps, though it’s made of much heavier paper and was unwieldy. I gave Son a brief tour of the Old Town. I noticed things a little quieter than in June. The streets were not heaving as much as it was. One of my favourite restaurants was not even open. We walked past the Parador down the street outside of the Old Town. I guess this is not the As-old section, but it’s still pretty old. In England, they’d be called cottages. The cobble streets and old gas light style lamps gave the place a charming feel. Following Google Maps, we made our way to Roots and Boots located about 15 minutes walk. It was a nice enough location but cost me €37 for 2 people. It surprised me how expensive it was from Booking.com. Maybe I wasn’t paying attention to the price. Overall, it was ok. Not the worst albergue I’d stayed in, not the best either. Lighting was poor, the bunks were very low and Son did not have a good night’s sleep because he was afraid of falling out of the top bunk as there were no bars. But he got to experience an albergue. Dinner was at a tapas restaurant back in Santiago. Yum! 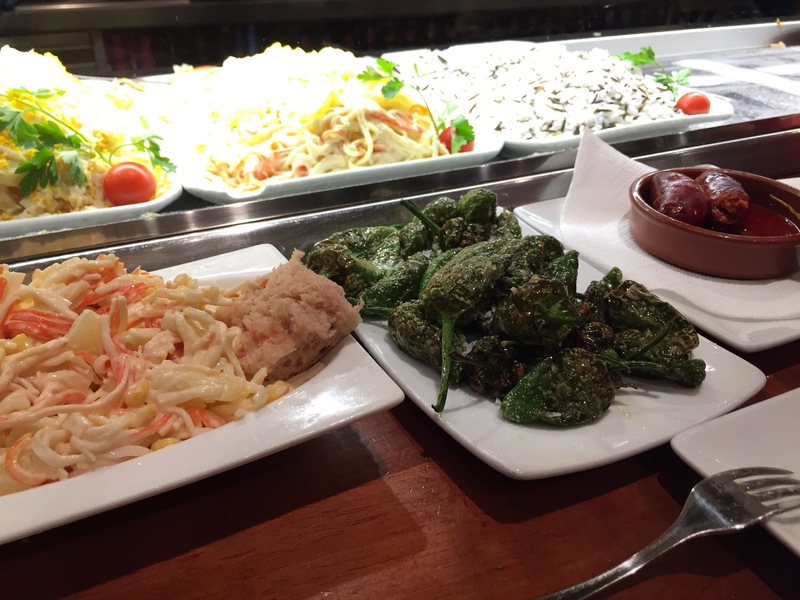 2 glasses of wine, 2 Cokes and 6 tapas dishes cost under €40. I love this place! 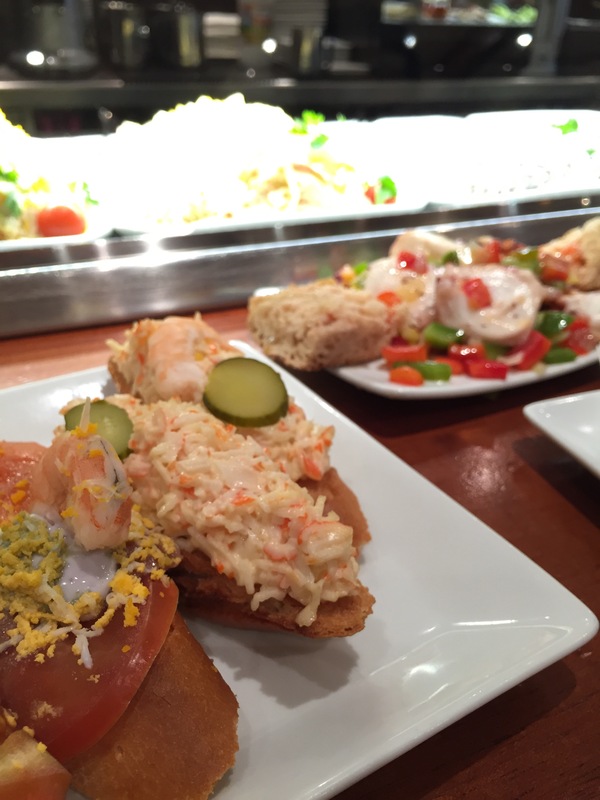 Smoked salmon in bread, crab topping on bread and pulpo. Chorizo, pimientos de padron and crab salad. 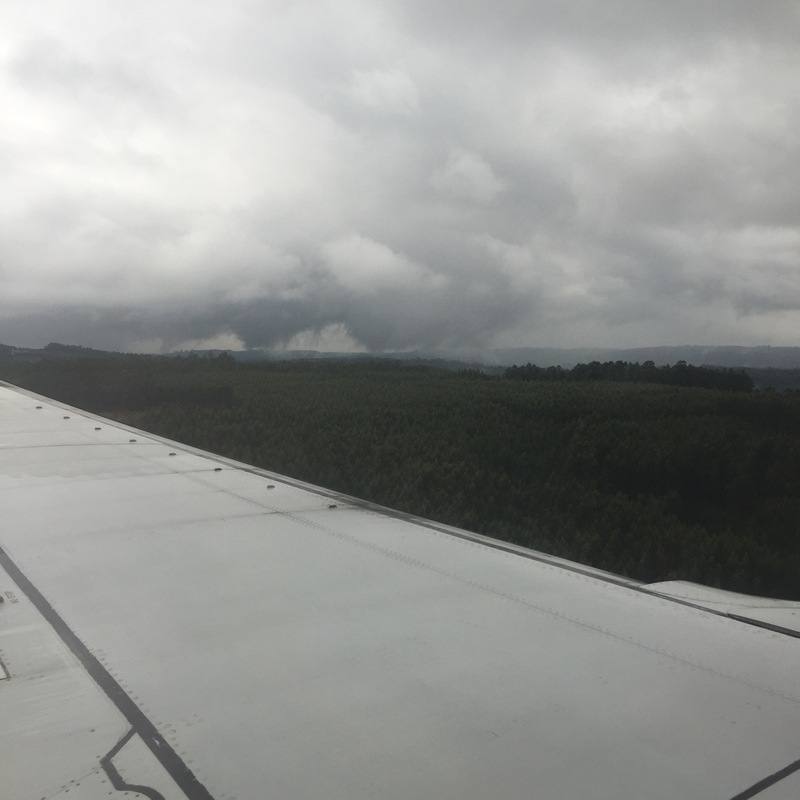 Rain clouds – a forewarning of the week’s weather to come. Oh my 🙂 you have an addiction..a good one at that however. 🙂 I will follow this Camino as I hope to walk this section next May all going well! Maybe it’s an addiction. Maybe it’s finishing off what I didn’t get to finish. It’s a nice walk. More remote.